It is that time of year when cabin fever sets in for some outdoor lovers. In my neck of the woods, it was certainly cold enough earlier this week to keep all but the most hardy souls indoors. With the exception of squirrel, pheasant and rabbit seasons (ending Feb. 28) and flintlock and extended rifle deer seasons in a few specially regulated wildlife management units and counties (ending Jan. 26), most hunting, except for predators, is about over for the winter. Below-freezing temperatures rendered moving-water fishing next to impossible, except for large rivers. On some lakes, the ice present is just beginning to be thick enough for hard-water fishing. As I write this, rain and a brief warming trend have replaced ice cover on my local streams with high, brown water. Fly anglers might hit the fly-tying bench – making their feathered creations with dreams of catching trout next spring. Others are waiting for the winter sport shows. But I have a better suggestion to get you outdoors – take a winter hike. Exercise is one benefit, but there are so many more. If you are a deer hunter, your favorite deer hunting areas are great places to walk when there is snow cover. A lot can be learned from finding a fresh deer track and following it. You might discover bedding areas, feeding areas and regularly used travel paths. The hike will also provide a good indication of how many deer are left in those areas after the hunting seasons. If you find deer beds, what do they tell you? Ask yourself why deer might have bedded there. Does the site offer thick cover or afford a vantage point to watch for danger? Might there be another reason? I discovered two deer beds early last week during a walk in Huntingdon County. They were on a high point of land overlooking a wooded hollow and an old railroad bed that served as a regular human pathway. From that vista, the deer could easily spot a hunter before the hunter spotted them. Knowledge of such locations can lead to success next deer season. 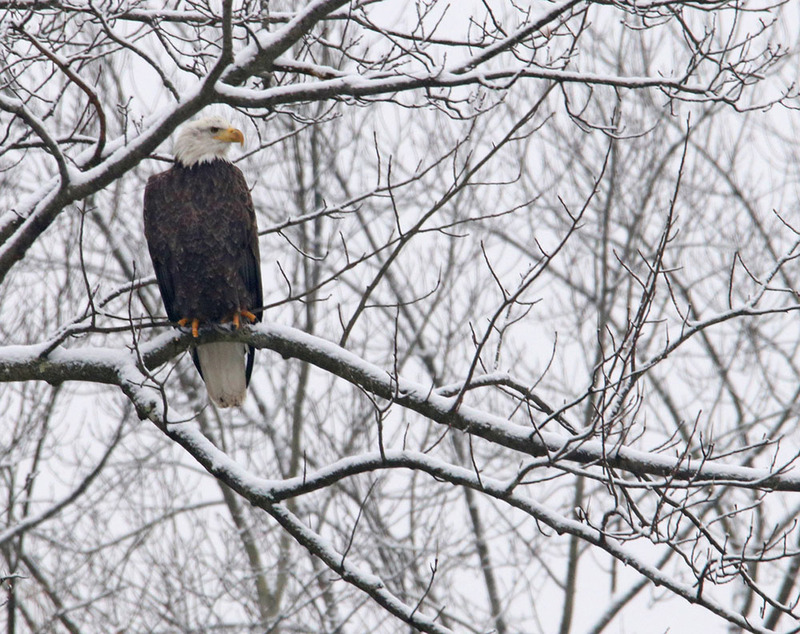 So, you are not a hunter – there is still much to see and learn from a winter hike. Last Saturday, I traveled to attend a family event in Elizabethtown. 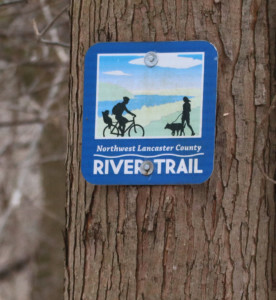 Based on the recommendation of a friend, I left home early so that I could stop at the Northwest Lancaster County River Trail. I walked a section of the 14-mile trail, beginning at the western trailhead at Falmouth. The Susquehanna River was high and off-color, but there were a few people out on the river, fishing from small boats. Another group of fishermen had gathered in the parking lot – probably talking about the one that got away. There was only an inch of snow on the ground, but I was able to see deer, squirrel, rabbit and assorted bird tracks in the snow. Bird life was abundant – juncos, titmice, nuthatches, cardinals, red-bellied woodpeckers and many others fed in and under the trees along the trail. However, my most exciting encounter was with a pair of bald eagles. 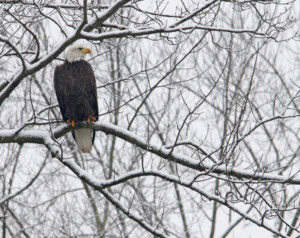 I spotted one mature eagle perched on a metal tower near the York Haven Dam. A short while later, an immature eagle flew by – heading upriver – then another mature eagle flew overhead, first landing on the tower and then perching below me in a nearby tree. The first eagle screamed, and it took me awhile to figure out what was going on. I discovered that the eagle pair had a nest just downstream from Falmouth and they did not appreciate me getting close. I backed off as soon as I realized the situation. This was educational for me because I had never before heard an eagle vocalize. Winter hikes can be so special. I also love studying topography and thinking about how the different features might have been formed. With the leaves down and snow covering the ground, Mother Nature’s landforms are laid bare. Little hollows, big rocks, sink holes and cliffs that were hidden by the foliage become easily visible. Pennsylvania has many places to walk during the winter – some are secluded and you might make the first human tracks, while other areas are more public and have people walking there every day. Almost every state park has hiking trails, as do state forests. Many rail trails exist and are likely more heavily traveled this time of year. If you are a deer hunter, the best location just might be an area where you normally hunt. Be sure to dress for the weather and wear warm, comfortable footwear. The walking will naturally warm your body as your heart pumps more blood to your extremities. Dress in layers and adjust accordingly. So why not take a winter hike? The exercise will warm your body and the experience will warm your soul.